To begin to answer this question we must first understand how electoral votes are allocated. Article II of the U.S. Constitution states that “each state shall appoint, in such manner as the Legislature thereof may direct, a number of electors, equal to the whole number of Senators and Representatives to which the State may be entitled in the Congress.” In addition, Amendment XXIII treats Washington D.C. as a state for the purpose of electing the President, and in effect the Amendment provides it with three votes. Total there are 538 electoral votes in play, (435 house members + 100 senators + 3 for D.C.). 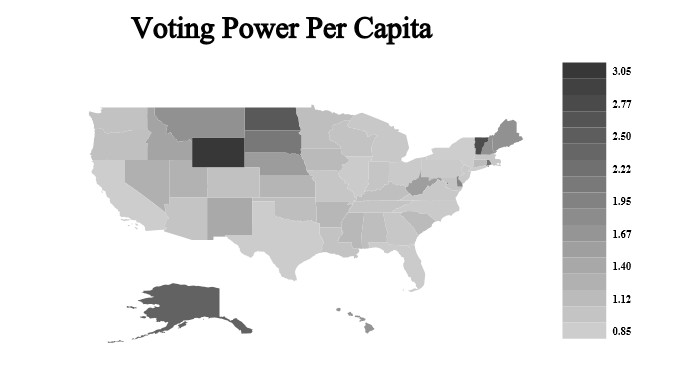 Due to the method of allocating electoral votes, the per capita voting power of the less populous states is enhanced at the expense of the more populous ones. To illustrate this point we will consider how votes would be allocated based solely on a state’s population in the cases of California and Wyoming. California is the most populous state in the country, and based upon the 2010 census, it contains 12.07% of the country’s population. Thus, if electoral votes were allocated based solely upon population it would control 12.07%, or 64.92, of them. Instead it receives 55, or 10.22% of the total votes. California’s voting power is 0.85 times what it would be if votes were allocated based on population alone. At the other extreme is the least populous state, Wyoming, which contains 0.18% of the country’s population, but which controls 3 votes, or 0.56% of the 538 total votes. If its votes were allocated based solely on population it would control just 0.98 votes. Thus Wyoming’s voting power is 3.05 times what it would be if its votes were allocated based solely on population. Overall larger states like California experience a diminution of power, while smaller states like Wyoming experience a growth. In fact 18 states lose some power, while the rest, including Washington D.C. gain. The map and table below show electoral voting power per capita for all 50 states and the District of Columbia. 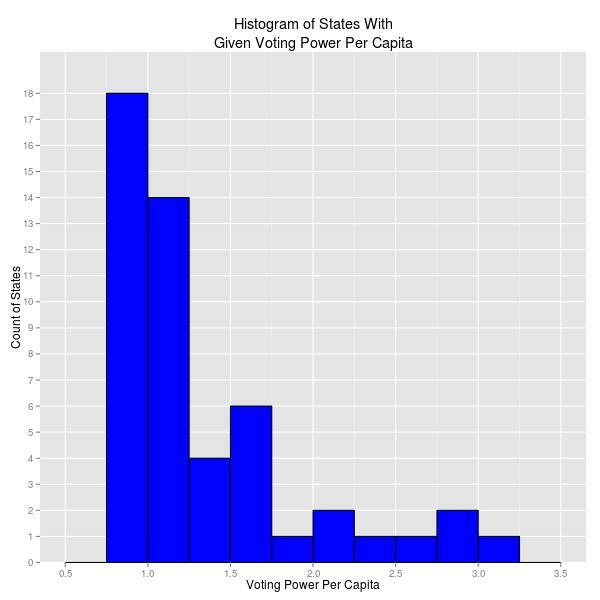 The histogram at the bottom shows the distribution of states over several per capita voting power ranges. 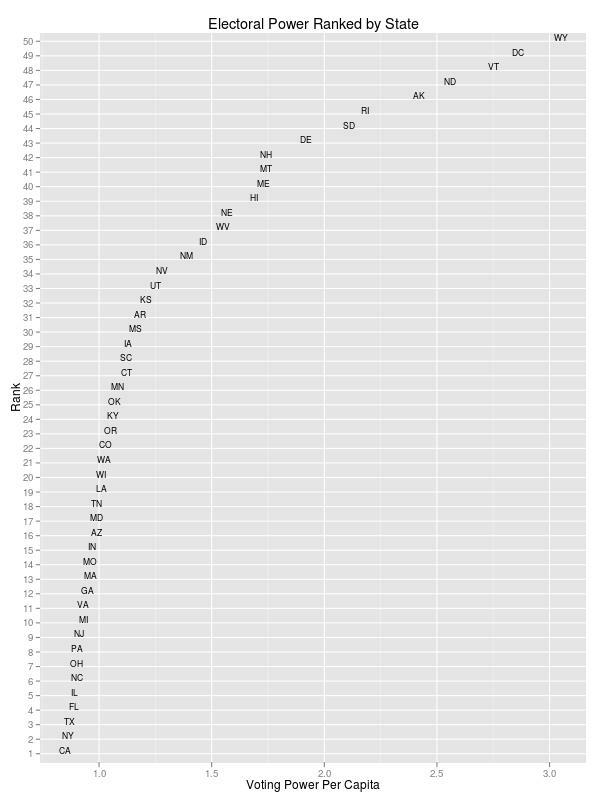 Finally, the last plot shows each state ranked by its electoral power. The data show that the least populated states benefit from a tremendous increase in electoral power, while the largest states suffer only marginal losses. My raw data can be found here, CSVs etc.